Your condo is also called a golf casita and will provide the best lodging. Just steps away from the casita is a beautiful golf club-house with two indoor-outdoor restaurants, Terrace Cafe and Catalina BBQ. The BBQ restaurant uses local ingredients and award-winning secrets. Tennis courts, walking/hiking trails, and mountain biking are also 'out the door' accessible. The living area is open beamed, tile floors, fireplace, also a large glass door for viewing wildlife outside. Rest outside on the patio and watch the fireworks, who can miss the Tucson stars? Take the Marriott shuttle from the nearby clubhouse (or your front door if you call) up to the 5 Star Marriott hotel for dinner at Primo or sit outside on the comfy couches at Signature Grill near fire pits and gaze and gaze at the beautiful stars. This is also a great place to meet other travelers or conventioneers. There is a complimentary wedding toast every evening around 4:30-5: 30 p.m. as part of the Starr Pass Marriott's special tradition. Feel free to send me questions if you want to know about the property. Salud! We are University of Arizona Wildcat graduates who could never fully leave the Old Pueblo. 20 years later we searched for and found this casita in Starr Pass -- to share with our guests from all around the country and the world. Top location in the resort development, quiet end unit w/best view. No road noise from Starr Pass Rd. Updated furniture and furnishings -- free parking and wifi. Spotless. Park in front of your vacation home, not blocks away!! Best elevation and view of all the Casitas. Steam Cleaned in between guests for spotless housekeeping. Stocked kitchen, no bare drawers The ONLY Golf course in Tucson with Bendt greens, including the Ritz!! Mountain bike and hike out your back door. Attend conventions at the Marriot with triple the room at a fraction of the cost Resort nearest the U of A, downtown and the airport and I-10. Within eye site of famous JW Marriott Hotel and Spa, Road Runner Golf Course.Starr Pass is considered by many as the best of all the resorts in Tucson for its location. Open park wildlife reserve, Rich in beauty and scenic desert terrain. Arnold Palmer golf course, the open air mountain bike park, all in our back yard. The view of the Old Pueblo from this vantage point is unsurpassed. We visited and stayed at all the developments and resorts in the Old Pueblo and came back to Starr Pass. There is something special about this desert oasis. This is a place to return to again and again. View is Best --Location, location, location. There are other places to stay in SP, however, none have this view, this location, an end unit on the master bedroom side = privacy and peacefulness, parking in front of the unit, great elevation, and view Comfort and convenience -- Option to rent 1BR or Studio as well as reserve multiple units for family gatherings and events Management is helpful and responsive Return Guests, Special Offer-- if we have you in our system as a return guest, email owner for special offer -- If you're a new guest, and you read this Unique Benefits section, mention Special Offer in your reservation request, or text me and ask about our special offer, you won't be sorry! Hint, do it before you make your plane reservation. Best view of Roadrunner Golf Course and Tucson Mountains. This property has the best position and choice height. Surrounded by Tucson Mountains. View of Tucson montains, stars, wildlife, etc. Bed linens are upgraded, soft and luxurious. Casita has a brand new stacked washer/dryer room right off the kitchen area in the casita unit. New washer dryer this year, Inside casita. One of the only casitas with parking right in front of the casita. With sliding door and view of wildlife. Also best view of the Roadrunner Golf Course, Tucson Mountains and the 5 Star Marriott. Also another mini in second bedroom. One in the main kitchen and kitchenette also in the second bedroom. Starter coffee, but if you are like us and love a special type, bring favorite or pick up at grocer. Stocked with all new dishes, pots and pans, coffee pot, toaster, silverware. Most staples. 5 Star Marriott hotel is on the property with 10 award winning restaurants. Catalina BBQ and all the Marriott Restaurants are convenient. We also recommend Arizona Inn for lunch and dinner. (3) Flat Screens! Special request from our wonderful male guests. Located on the side of the living room flat screen television. There are usually a couple dvd's t'hat we all leave, but I would bring your own or Target has inexpensive dvd's. We are on a golf course and there are grassy common areas; gardens in the common area are desert vegetation labled. Available for rent nearby at the JW Marriott, also guided tours are available for bikers. House is all one level, all one level parking to front door, also. Double Olympic Resort pool with jacuzzi and work out room, lounge chairs and tables. Grass area and landscape to enjoy poolside. At Olympic pool near casita and at Hashini spa for paying guests. We loved our vacation in Tucson. The condo was perfect- clean, nicely furnished and well stocked with everything we needed, and the owner was great to deal with. We especially loved the location, the spaciousness of the condo and the facilities including a fabulous pool, lots of great restaurants on site and nearby and the surrounding scenic views of the mountains etc were epic. The local wildlife was pretty cool too- loved the birds and wild javelinas who visited us at the casita ! There’s plenty to do in this area and we really enjoyed hiking in the nearby parks. Bernie, we are so happy you enjoyed your time at the Owl casita in Starr Pass. It's unique to be out in the mountains, amongst javelins, roadrunners, cardinals, mule deer and still be steps from the 9 restaurants at the JW Starr Pass Marriott. Guests can walk out the glass door to hiking, mountain biking, or 5-star dining. I was so happy you could enjoy the warm days at the pool. You and your party are a delight to have stay. It makes us so happy when guests loved staying in the owl casita and take such good care of it. You were great to have and we hope you will return soon. Thank you for the 5-star review. It warms our hearts and we appreciate your appreciation! Please send us your friends and family, we will love to have them stay!! Come back soon! The casita had everything we needed for a very comfortable week. The owner was great to work with. It didn’t hurt that we had wonderful weather,too. Great facilities. Very good location. Our last few guests have commented on how quiet the property is, making it a good place for R and R and catching up on rest. The area has lots of activities close by as well. We look forward to having you back. You were wonderful guests. Thank you for staying with us. Very nice accommodations well appointed with all the convenients. Quiet and peaceful. Enjoyed feeding the birds. We look forward to returning next year. Thank you Paul, for the compliment. You were lovely guests and welcome back any time! We're so happy you found one of best features, the lovely birds in our area are so lively and entertaining. Mahalo! The property was adequate for our needs and is well-equipped and provided. We were surprised, from the photo , of the website that the pool was somewhere else over the road. Did not matter to us but would have been a disappointment if we had expected it to be adjacent . Maybe I missed the info in the advert. My husband and I were so looking forward to our stay at Starr Pass this January. We stayed for 10 days, and our casita was everything we hoped it would be. It was comfortable, well equipped, and tastefully decorated. Pam, the manager was very helpful and attentive. The nature was amazing, and we enjoyed using the bird feeders while we were there. We saw many hummingbirds, quail, cardinals, cactus wrens and more. Plus desert life like javelina, coyotes and antelope squirrels. We were an easy drive to our favorite spots like the Desert Museum, downtown Tucson and Tahono Chul. We hiked every day and enjoyed to pool when it was warm enough. We would love to come and stay again sometime. Thank you for being wonderful guests and thank you for the compliment. We love to hear that your precious time to relax and enjoy was a resounding success. The wildlife in the area is such a treat. Guests really have to experience the uniqueness of the vegetation and the amazing desert for their self. Please do come back again! When our guests are happy, we also are appreciative and happy. Return guests get special perks, including early arrival and late departure when available offers and discounts for extra nights. You can contact me directly next time! Salud! 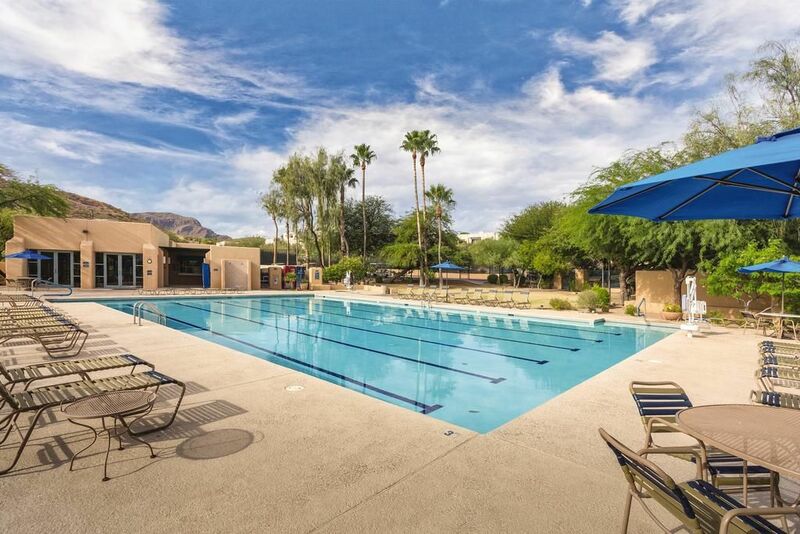 Resort with the most spectacular location: Starr Pass is nearest to the airport, U of A, downtown Tucson, Old Tucson, Arizona Desert Museum, Gates Pass Lookout, are all close by. (Guests, please create a guest profile for faster communication. It helps us understand if we are a good fit for your travel plans. I always check the Guest Profile before making a reservation. Thank you.) On the grounds: 10 restaurants: Salud Bar is a star gazing epithelium. Relax on comfy couches with glowy fire pits, Signature Grill is Arizona's best daily breakfast buffet (or order off the menu) famous for their sticky buns and organic choices; upscale PRIMO restaurant, many dishes made with the chef's garden grown herbs and vegetables from on the property, interesting beverage bars, organic drinks and dishes available. Starr Pass Marriott Hashani Spa saline spa pool is a stress-no-more spot. Starr Pass is an open park environment. Wildlife, javelin, mule deer, birds, rabbits, quail, roadrunners. Monthly Rates: Our base rate for 15 days is $2000 in 2018. We generally don't book for 30 days at a time, except under special request. Please email host. We receive a lot of inquiries for 30 days or more Jan - March the monthly rate is typically above $4,000. If you inquire for a monthly rate during these dates, it make take us longer to get back to you due to the influx of requests. Thank you for your patience. Owner handles deposits as a Security Deposit that converts to a Damage Deposit. Strict, Firm or Relaxed policy depends on the season. Owner handles on a case by case basis. Guests agree to owners policy: with a schedule conflict 60 days out, alternative dates will be provided to guest by owner. Within 60 days alternate dates aren't promised. Owner reserves the right to override our own policy at any time.